A Cluster of 4 Cute Cottages 1, 2 & 3 BR's All Updated and Ideal for Families. 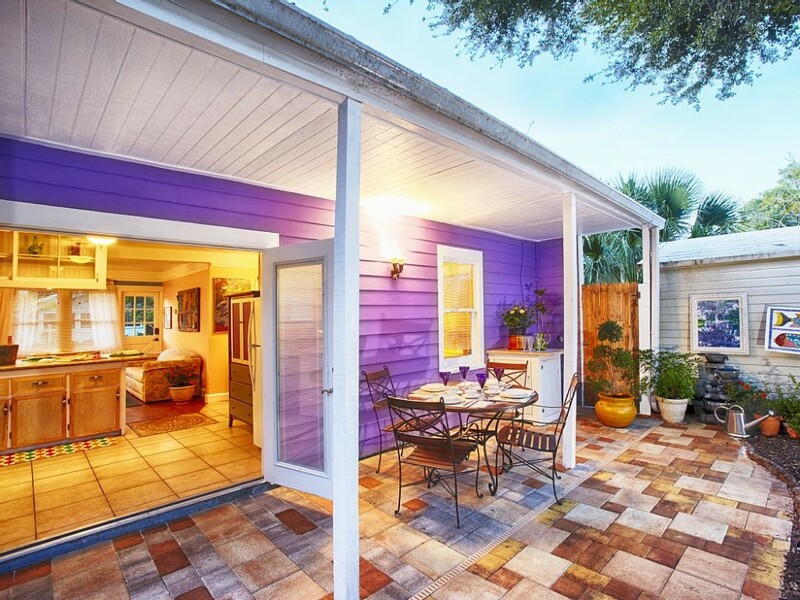 Historic Sarasota Cottages Meets Key West Cool ~ Meets Shabby Chic. Please check with us regarding availability for the dates you desire. We have several housing options, accommodations for couples up to groups of 20. Why stay in a stuffy, cookie cutter hotel room when you can enjoy the unique layouts of our Cottages that offer you an authentic Florida experience in this friendly and laid back neighborhoodY Throughout are contributions of local artists with wall colors to highlight their work. Off street parking for 2 cars. We've upgraded our WiFi with the latest MESH technology assuring our guests of stable and fast connections. Welcome to the Gold Cottage. Having gone through extensive renovations, we're unveiling this gem and making it available to knowledgeable visitors to Sarasota. 'Gold' Cottage is a remodeled mid fifties 1-1/2 BR/1BA. 'Gold' Cottage guests enjoy comfortable and whimsical furnishings. The open space plan draws guests into the living room where there's a 52" 4K Smart TV with cable and streaming programming. You'll find the sofa-bed convenient for overnight guests. The space is divided by a granite sit down counter-top which defines the kitchen area. The stunning glass-tiled bathroom has an oversized shower. The colorful main bedroom contains a queen sized bed and the office offers a comfortable couch, a view of the garden and a welcoming desk for that journal writing. Moving toward the rear of the Cottage, French doors open onto an enclosed landscaped backyard garden. Shaded by an indigenous Giant Oak tree, is an oasis where you may choose to dine alfresco or lounge on a chaise. Depending on the season, this may become your favorite spot. At any time of year, the seats on the front porch afford a good view of the sunset sky, or walk 7 minutes to watch the sun set over the bay. The washer and dryer are conveniently located off the kitchen. Please inquire with your preferred dates and we'll do our best to accommodate your group. Long term rentals in the off season are also welcomed. Due to the City of Sarasota Zoning Code, we are NOT able to rent for periods shorter than seven days, nor rent to more than four (4) unrelated persons. We take NO-SMOKING very seriously. Smoking in the Cottages or anywhere on the premises will result in loss of damage deposit. If you or any of your group smoke and cannot abide by our policy, please find another place to stay.